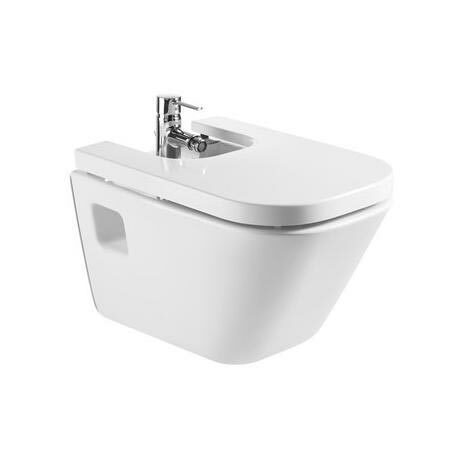 A compact modern stylish vitreous china wall hung bidet with soft-close cover, transform your bathroom with one of our contemporary designer bidets from Roca's The Gap collection. Manufactured by Roca using the best materials and production methods, this means products are more resistant, durable, easy to use and maintain. Supplied with a quality soft close anti-bacterial cover. The stunning wall hung Bidet from Roca is a visual masterpiece and evokes the feeling of a luxurious spa or hotel, making it a favourite for 2013. It is made from vitreous china making it hardwearing and robust, but also easy to maintain as the cover has been formed in an antibacterial material. Its wall hung function make it perfect for a bathroom lacking in space and also means it is easy to clean around.